For most business analysts, visualizing data is an everyday occurrence, and just like any good analysis, a great visualization starts with utilizing the right data. The problem is most analysts spend too much time preparing data, getting it in the right shape or format, and not enough time visualizing the data to discover critical business insights. 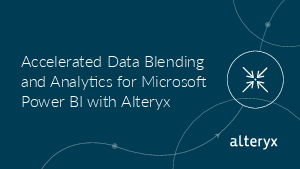 By combining the power of Alteryx and Microsoft Power BI, you—and your entire organization—can streamline the self-service analytics process.